The website is an extension of this mission. The more a person understands about their health the better the outcomes. However, Seymour Dental is also personable in its approach. There are aspects of the website and our online presence that are a bit of fun – the Seymour Dental blog, Facebook and Twitter that allow us freedom to express and interact. The heart of any website is the content, and the best way to find the content you are looking for is the search field. There are a lot of articles to explore, so finding what you want is as easy as typing in a keyword. The blog articles or web pages associated with that word will appear in a listing of search results. At the top and bottom of the search results page, there will appear links titled “newer posts” and “older posts”. These links allow you to browse through the search results page by page, as the search will order the result based on when they appeared on the website. There are also many links that will help to group information conveniently when you are researching information on any particular topic. In the Services section there are “learn more about this service” links which lead to pages that provide information on that service. On the side are links to the other services. At the bottom of this page is a blue box with “Read more about …” – this is a link to all the blog articles that are associated with this service. As more blog articles are added weekly, this is always changing. 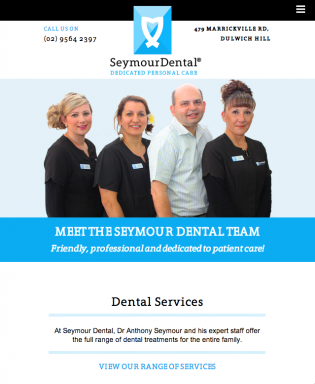 The About Seymour Dental section contains information on our mission, facilities, the team, opening hours, location, and payment options. 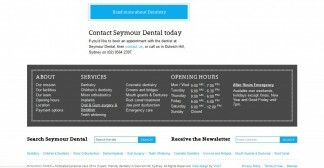 On the side are links to all the sections within the About Seymour Dental section of the website. At the bottom of each of these pages is a blue box with “Read more about …” – this is a link to all the blog articles that are associated with the topic of that page, and the content that this link displays also changes as new blog articles are posted weekly. Links within articles to other blogs associated with a word or phrase are found by clicking on blue highlighted words. The dark grey box at the foot of every page has quick links to items about the practice and services we provide by clicking on the listed words.